Recommended blade for cutting hard materials such as porcelain tiles, granite, rustic tiles, clinker, refractory and slate. The specific design of the diamond band offers greater speed of cutting harder materials without sacrificing finish quality. Only for straight cuts, not suitable for mitring. For wet cutting. Water cooling is required. 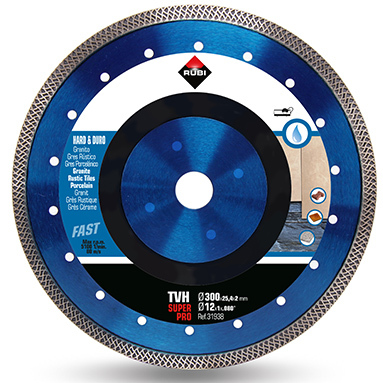 Rubi uses laser technology in the TVH blade to join the diamond rim to the steel core of the blade. Laser welding is the best guarantee of quality and safety in the production of diamond blades. Rubi Superpro blades are the best choice for the most demanding jobs. Outside diameter - 250 mm. Inside diameter - 25.4 mm. Disc segment height - 10 mm. Segment thickness - 1.6 mm. 300mm model pictured. 250mm blade will be supplied.